Industry-first technology combines food waste information with behavioral science to raise consumer awareness and spark behavior changes. Portland, OR – August 23, 2017. LeanPath, Inc., creators of the world’s leading food waste prevention platforms, announced the release of its new digital signage product this week, LeanPath Spark. LeanPath Spark brings food waste information to life on displays, combining high-impact messaging with real-time feedback loops. Spark may be installed in the front-of-house to educate consumers, or in the back-of-house to inform kitchen staff about food waste priorities. Created in partnership with behavioral science experts, the data-driven signage draws on proven engagement techniques to raise consumer awareness and spark behavior changes to help reduce food waste levels. Among the LeanPath clients deploying LeanPath Spark is Aramark, a global leader in food, facilities and uniforms, who is implementing consumer-facing digital signage in five college and university dining halls that it operates. 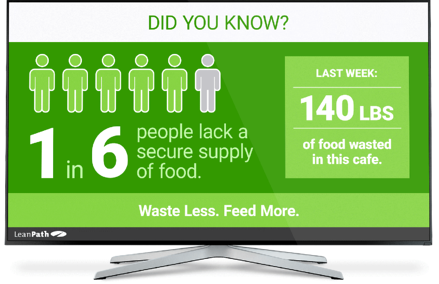 LeanPath Spark digital signage [example screen pictured above] integrates real-time food waste information with high-impact messaging to inspire consumers to waste less food. LeanPath Spark food waste signage integrates with all of LeanPath’s tracking platforms, connecting with the LeanPath data cloud to display information on any display monitor. Spark highlights food waste data such as how much has been wasted versus prior periods, and equates wasted food to meals lost and environmental equivalencies to emphasize the personal consequences of food waste. LeanPath Spark was released in Beta form in early 2017, and is now available for general release. To learn more, visit www.leanpath.com/spark. LeanPath is the world’s leading food waste prevention company, providing platforms that enable commercial kitchens to dramatically reduce food waste and operate more sustainable facilities. Founded in 2004 in Portland, Oregon, LeanPath has offices in both the US and the UK and its technology has been installed in nearly 1,000 kitchens in more than 20 countries across the globe. Typical results include a 50% reduction in overall food waste. For more information, visit www.leanpath.com.